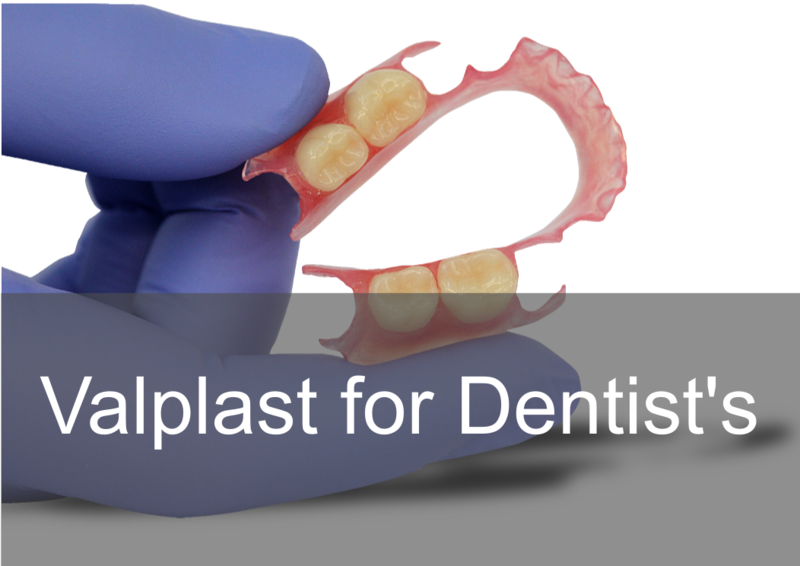 'Valplast® Flexible Partials' are the first flexible partial in the world and has over 60+ years of research and development. It's a 'Nylon' based material, which makes it 100% 'Monomer Free', 'Flexible, Thin, Comfortable' and 'Easy To Adapt To' with a life long guarantee. It's routinely used as an alternative to acrylic partial dentures and is used for one tooth partials to 'Hybrid Cobalt Chrome Partials'. 'Valplast® Flexible Partials' have a unique clasping system, the 'Flexible Clasps' are translucent with natural gingival shades and provides 'Retention' and 'Reciprocation' that blend in naturally with gingiva. The major connector is designed to sit on the cingumlum of the anterior teeth and acts like an 'Occulsal Rest'. There is also relief on areas around the periphery and bony areas, this stops adverse pressure on the, gingiva, gingival tissues or periodontum. 'Valplast® Flexible Partials' are easy to adapt to, light weight, thin and flexible which makes them comfortable to wear for the patient. They blend in naturally in the mouth whilst being held firmly and securely with 'Flexible Clasps'. The 'Nylon Material' is flexible and makes the 'Valplast' virtually unbreakable with a 'Life Long Guarantee'. It is not recommended for complete dentures, gum fitted anterior teeth, over closed OVD (tight occlusion) or small inter-occlusal space. We provide short CPD presentations on Valplast to practices for their associates which covers product information, advantages, selling points, limitations and clinical support, please phone us to book a short presentation.